This gem of a recipe was tucked away in “The New York Times Cookbook,” by Craig Claiborne. I know, 2 recipes in a row from the NYT cookbook, I’m out of control. These old-fashioned holiday recipes are hard to resist and unlike my grandmother’s books, Craig Claiborne has many. Although he was fond of my grandmother’s work, I have to believe that she may have learned more from him about holiday baking than he did from her. Since Christmas (or any holiday really) was not celebrated in the Peck household, her festive recipes are few and far between (as I mentioned in the Edible Manhattan article I wrote last December on her Linzer Torte). 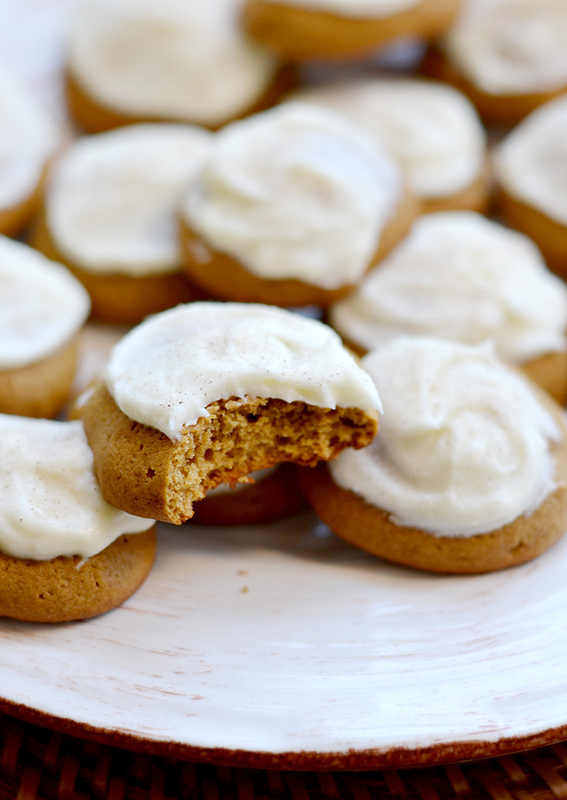 I made quite a few modifications to this recipe, originally titled Soft Molasses Drop Cookies. I substituted butter for shortening, added seasoning and spice to make them more of a ginger cookie, and used a cream cheese icing instead of the suggested chocolate frosting in the book. I’m just not a fan of gingerbread with chocolate but creamy tangy cream cheese adds a nice acidity and contrast to the spicy rich molasses flavor. Those fancy gingerbread houses, men, stars, and candy cane shapes are fun but I can probably make and eat a whole batch of these drop cookies in the time it takes you get your gingerbread house components into the oven. Plus these are SOFT (not like the brick version that breaks your teeth) and each bite comes with the perfect amount of flavorful cream cheese icing – tough to beat in the chaos of holiday baking. Beat the butter, vegetable oil, and sugar until light and fluffy. Beat in the molasses, egg, and 3 tablespoons of the flour. Sift together remaining flour and the other dry ingredients. Mix together the vinegar, water, and buttermilk. Add alternating to the molasses mixture and beat batter until it is very smooth. Drop teaspoons of the mixtru onto the cookie sheets. Bake 12 to 15 minutes. Cool. 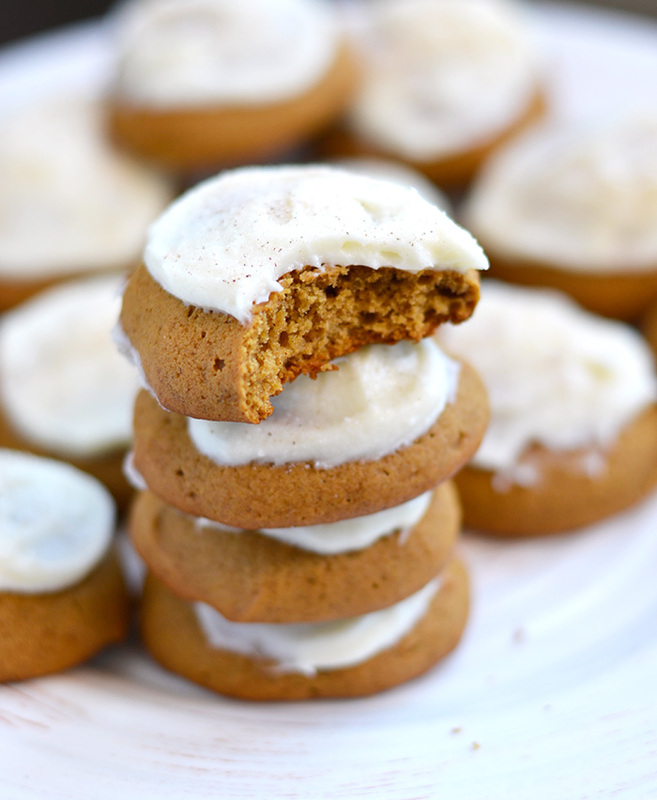 Top each cookie with a round of cream cheese frosting. Mix the butter with cream cheese until well combined. Add vanilla. Slowly beat in sugar. If you put these cookies in front of me, I would eat EVERY SINGLE ONE. I almost did! Thanks Rachel! Thank you for this amazing recipe. I doubled the recipe 2 nights ago and made 6 dozen (+ a few) cookies. I brought 5 dozen to work for a Christmas cookie exchange. I did not bring a single cookie home. The soft gingerbread cookies were awesome! My cookies baked pretty quickly in my convection oven so I lowered the temp. a bit. They were done in about 8-9 minutes. I used pre-made cream cheese frosting. It was very very late in the evening in my defense. I have never had cookies come out this well. It was like biting into light puffy little ginger clouds. Sooo good! My one question is “What did you sprinkle on your cookies in your photos for the recipe?” Thanks so much! P.S. I already emailed the link for this cookie recipe on your blog to my coworkers. That’s great Maureen! I’m so happy you enjoyed these so much. I love the name puffy ginger clouds – I should have called them that. Nothing wrong with taking a shortcut and buying pre-made frosting – we all need to save time during the holidays. Regarding your question, I just sprinkled cinnamon sugar on top for a little texture and sweetness. I later decided it didn’t really add to the recipe at all so I left it out. Thank you for the wonderful comments! Hi Meghan… for the cream cheese frosting did you use salted or unsalted butter? Hi Tammy! So sorry for the super delayed reply here. I always use unsalted butter for desserts, baking, and cream cheese frosting. I cannot wait to make these yummy treats! I was wondering, how far on advance can you make them and do they need to be stored in the fridge because if the cream cheese frosting? Thanks! Thanks for the comment and sorry for the delay. They can be made a day in advance though they really are best the same day. You can make the cream cheese frosting a few days in advance though. Regarding storage, I usually store them in the fridge but they can be left at room temperature for up to 2 days. Hope this helps! These look delicious! I’m making them for our cookie exchange at work. Your recipe calls for butter. Did you use salted or unsalted? I just made this recipe for the first time, And they are already a family favorite for the winter holidays! I used a soy cream cheese for the icing. I made a second batch, this time vegan for friends at work. For the butter and egg I substituted 1/2 cup applesauce and 1 TBSP oil. For the icing I used the soy cream cheese and no butter, added 1TBSP oil to smooth it out. They turned out good although a little on the chewy side (I think I stirred too much). The icing was a little on the thin side but still tasty! Hi Dawn! Thanks so much for commenting. These are great suggestions for various dietary restrictions. I think ground chia could also work as an egg replacement but also love the applesauce/oil idea. Soy cream cheese is a great vegan alternative for regular cream cheese. For anyone with soy allergies, an almond cream cheese like Kite Hill is also a good option. Thanks again for the great ideas!! Does the “Soft Gingerbread Drop Cookies” dough freeze will? I had planned to split the dough in half. Baking 1/2 the dough and freezing the other half for future use. Hi Dolores! Freezing the dough should be no problem. I haven’t tried freezing this particular dough myself but I’ve frozen similar ginger cookie dough and it works great!